Baby Namings are held during the service on Friday evening for congregants and on Saturday morning for noncongregants. 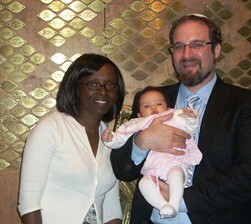 We offer a one-year guest membership to families who have their baby named at Temple Isaiah. Please contact the office for more information. Bar/Bat Mitzvah students are moving from childhood to adulthood, from learning to be responsible to being responsible. As a son or daughter of the commandments, you commit yourself to be proud membership in our ancient people. For more information, please go to K-12 Opportunities. The Rabbi will lead you through the process of becoming a Jew–from education and counseling, to your trip to the mikvah, to the conversion ceremony. The Rabbi meets with the engaged couple to help them prepare for this special event. Our sanctuary is available for members’ use. Prayer can give courage to those facing difficulties and comfort to those who suffer. Temple Isaiah includes a prayer for healing at our Evev Shabbat services. Our clergy are available to families and individuals in need of support and will make hospital and home visits when possible. If you are facing illness or other difficulty, please let us know. If you are in the hospital or know someone who is and would appreciate a call or visit, please call the temple office. Our Temple Isaiah community offers support and comfort to our fellow congregants as they cope with the loss of loved ones. The Rabbi and Cantor conduct funeral services in our sanctuary, at local funeral homes, and graveside at the cemetery. They are available for grief counseling. Lay leaders assist with minyan services. Temple Isaiah has two sections at Washington Memorial Park in Mount Sinai.